Hello, we are in the process of remodeling our home using chocolate gray stones on the front exterior of the house and garage. We will be using board and batten for the front porch and the sides and back of the house. The porch will have four 10″ columns, linen in color, and the window trim and garage door will also be painted in linen color as well. Since I am dealing with a lot of gray in the stones, I would like your opinion as to what color I should use to paint the siding and my front door. I am looking for a house color that will bring out the beauty of the stones and also an ascent to the front door. Any suggestions on your expertise would be appreciated, and look forward to hearing from you soon. Have a look at Ben Moore’s Kendall Charcoal for the siding and Richmond Gold for the front door. I think you’ll like them with your rock and trim colors. The beautiful dusty gray green blue and gray stone. 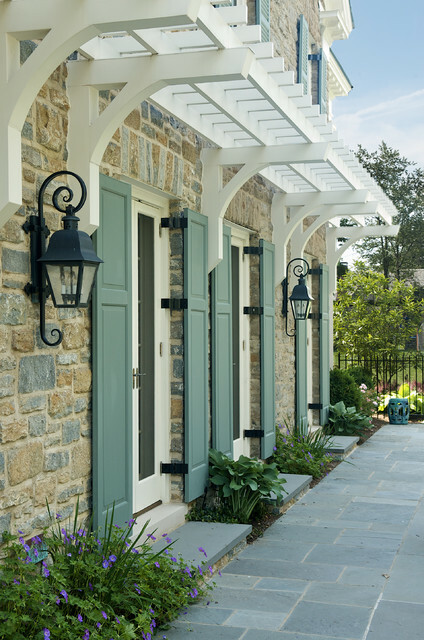 Need to purchase stone similar in color and would LOVE the formula of the shutter color this picture has the white overhang. Sorry for the delay! Wish I had the the formula!! Start in the gray part of the fandeck and work your way into the slightly blue-green shades. Your color will be there. Try a few to be sure. Hi! I desperately need your help with the exterior of our home ! Is there a way I can post a photo for you to help? Thanks so much ! 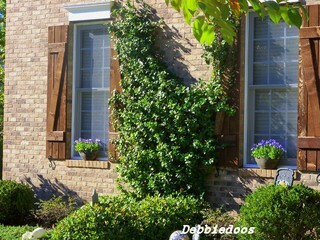 You are currently reading Shutter Color Inspiration for Stone and Brick Houses at Your Home & Color Coach.